Recognise any of this scene? Yes, but I've got to rush, that's my 102 'bus to Gleadless about to go - if I have remembered correctly. The Gleadless buses were certainly the 101 and 102 until the mid-sixties when the 51 was extended across the city. It got a bit complicated with variable routes due to short workings to Arbourthorne being given a different number and routes varying at certain times of the day. I can't explain it all at the moment (timetables are not to hand) but someone had a go back in 2011. It ended up as 5 blogs, of which the 3rd and 4th are most pertinent to this complexity. One evening we were in the workshops for night school when a policeman appeared at the door, He asked if anyone owned a mini parked outside. Apparently some ****** had lobbed a house brick from the multi--story car park and it had gone straight through the roof of the car. I remember this same view, again for similar reasons. Didn't often get the chance to take photographs from this location, as I was usually, either late and rushing off to a lecture, or racing back down to the bus station in order catch a number 93, or a number 23. Incidentally, it wasn't me with the brick. I would never have been so wasteful as to throw away a perfectly good brick. Have you seen the price of those things? The Gleadless buses were certainly the 101 and 102 until the mid-sixties.. Thanks Annie. What I meant when I said "from memory" was that the 102 (and perhaps the 101) departed from that stand just beyond the arch-roofed building. I used to catch them on my way home from King Ted's, alighting on Gleadless Common just below the junction with Gleadless Avenue which was the road where I lived. There was also a 105 which went somewhere in Gleadless but I don't think it went down the Common. My misunderstanding, there. 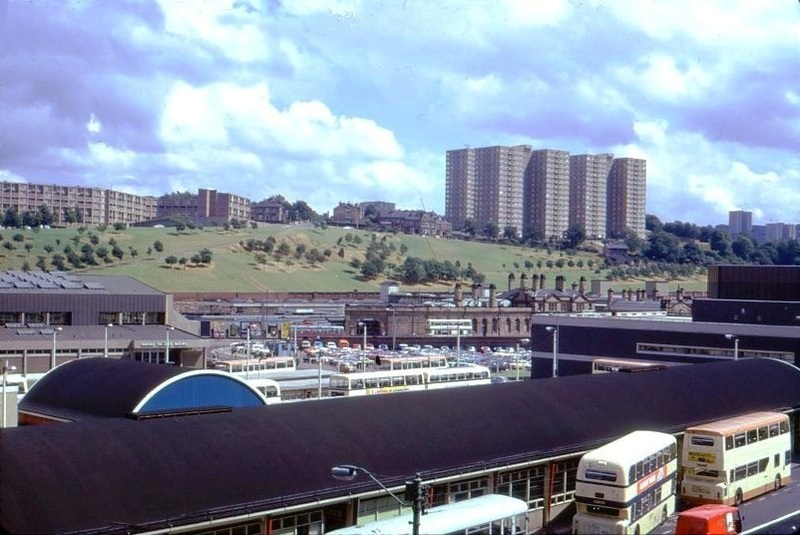 The 101 & 102 (and 105) were before my time as I was but a babe in arms when the 51 was extended to Gleadless. It would not surprise me that they used platform B as the replacement 30 (and 105) used that platform as did subsequent variations on the Arbourthorne bus routes. The 105 was originally Arbourthorne short workings of the 101 & 102, but after 1958 at certain times of day it was extended via Gleadless Common to Gleadless Townend. The 105 survived the coming of the 51 and later became peak hour journeys only before being renumbered 72 in 1973 or 1974. When it disappeared completely I can't remember. Enough digressing. 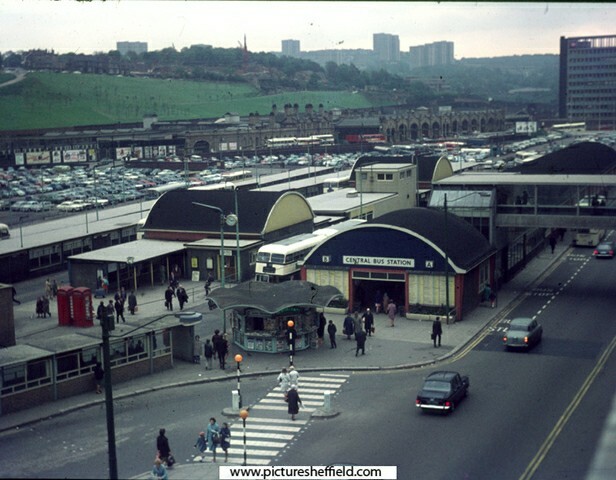 Although I don't remember Pond Street Bus Station in the 1960s it looked very similar in the late 1970s and beyond when I did use it more often. The picture posted by Unitedite Returns is very much my image of the Bus Station, with all the rear-engined buses in a mixture of Sheffield Transport and SYPTE liveries. I did not get to use Pond Street very often when I was young as my mother preferred the 51. My use of the Bus Station was when I was a teenager by way of a 63 or 64 into the Bus Station with friends and then across Pond Street to catch a Football Special to Hillsborough when they ran from there, or when I was travelling to or from Manchester by coach during my student days over the other side of the hills. Good info, thanks. You have jogged another memory: although I probably attended soccer matches at Hillsborough on about four occasions, with Dad, friend or both, I have absolutely no recollection of how we got there - and no, at age 11 or 12 I wasn't drunk! I think it must always have been on the 'bus. I do remember that in one of the opposing teams was Derek Dougan, and Dad telling me that he was quite famous. A look at his biography suggests that Owls must have been playing Aston Villa that day. No need to apologise. I don't remember the name - he certainly was not in my class at Gleadless County junior school (which I left in summer 1960 or 1961, can't remember). I may have known him by sight of course. Would he be of a similar age to me? My mind isn't what it was, it must be said. The Haywoods lived on the Common near Brown's Stores. They didn't move there until around 1970 I think. I went to Gleadless County too, later than your good self, I left 1971. (Incidentally, where did the name County come from, I've never got to the bottom of that!). It goes back to the West Riding County Council (WRCC) 1889 to 1974 and boundary changes between those years when Sheffield, and other larger towns, were extending their boundaries to build more houses. Prior to 1974, and to the south, the Chesterfield Rural District Council, administered by Derbyshire County Council, became the North East Derbyshire authority. The schools in the former County Areas were usually referred to as "County" schools defining their historical provision. Hope this helps! Thank you Voldy, that's impressive. At last I know after all these years! Who remembers 41209 and 41245? The two 2-6-2 tank engines which were used for shunting ("station pilot" I think it was officially called) duties at Sheffield Midland? Although difficult to make out on the picture there is what I believe to be a member of the Ivatt 2MT 2-6-2T class, probably on the Barnsley "push&pull" awaiting departure. Apparently Royston based locos were usually to be seen on this route. 41246 was also used in Sheffield being allocated to Millhouses until its closure on 1st January 1962.